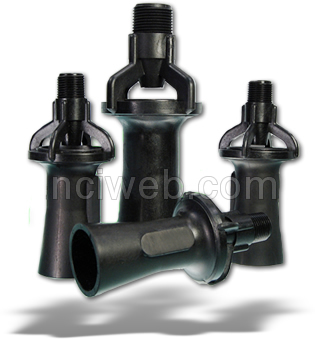 Tank Nozzles are designed for "in-tank" applications. The TLM operates on the principle of flow dynamics pressurized fluid is accelerated through the nozzle to become a high velocity stream that entrains tank contents and intimately mixes with them. This combined stream exits the TLM at a high velocity creating a flow field capable of causing additional agitation and mixing the tank contents. The Tank Nozzles' motive fluid may come from two sources. The tank liquid may be re-circulated through the eductor via an external pump or a secondary fluid may be introduced into the tank. Gases, as well as liquids, are used as the secondary fluid. Aeration and gas dispersion for chemical reactions are common uses of gas motive systems. Liquids are typically additives to be mixed with or to dilute the tank contents. Add the optional adapter and have the ability to adjust the direction of the spray pattern by simply twisting the cap, reposition the tank eductor and then re-tighten the cap. This option makes changing the flow pattern a snap. For sizes 1/4" and 3/8" only. Our eductors use a unique venturi design which enables smaller pumps to circulate large volumes of tank solution. The eductor will circulate four to five gallons of solution for each gallon pump through it. Our tank eductors are used for mixing chemicals, suspending solids, adjusting pH, "sweeping" debris or sludge toward a filter intake and many other useful applications. We stock our PPL & PVDF eductors from sizes 1/4" through 1-1/2" to better serve our customers. Computer optimized flow paths enable the model TLM to maintain a high "pick-up ratio" (the ratio of fluid entrained to the motive fluid) while maximizing the hydraulic efficiency (the ratio of hydraulic power at the outlet of the TLM to the hydraulic power at the inlet) to generate an optimum flow field from the greatest flow amplification.